Moving the location of alert management for predefined admin alerts in the Admin console to the system defined rules section. Adding optional email notifications for more alerts. We hope that this will help you identify and take action to resolve potential issues affecting your domain. To get the most out of the alert center, you could also sign up for our recently announced beta, which will help you collaborate and track the status of alerts within your domain, as well as triage faster with insights from related alerts. To see predefined admin alerts, go to Admin console > Security > Alert center > Settings (gear icon), or directly access the new System defined rules section. Use our Help Center to find out how to set up and configure administrator email alerts. End users: No action needed. The alert management controls for predefined alerts could previously be found at Admin console > Reporting > Alerts. They will now be at Admin console > Security > Alert center > Settings (gear icon). There will be no change to any settings (whether email alerts are on or off, or the email subscriber list for any alerts) or the content of the alerts. We’re just moving where you should go to manage them. There will also be no change to the location of custom alerts. For the moment, they will still be at Admin console > Reporting > Alerts. We’re adding an option to get email notifications for several existing alerts that previously didn’t have the option to receive emails. For each alert, you can choose whether to turn them on or off, and to specify which email address the alerts should go to. The email alerts will be on by default. 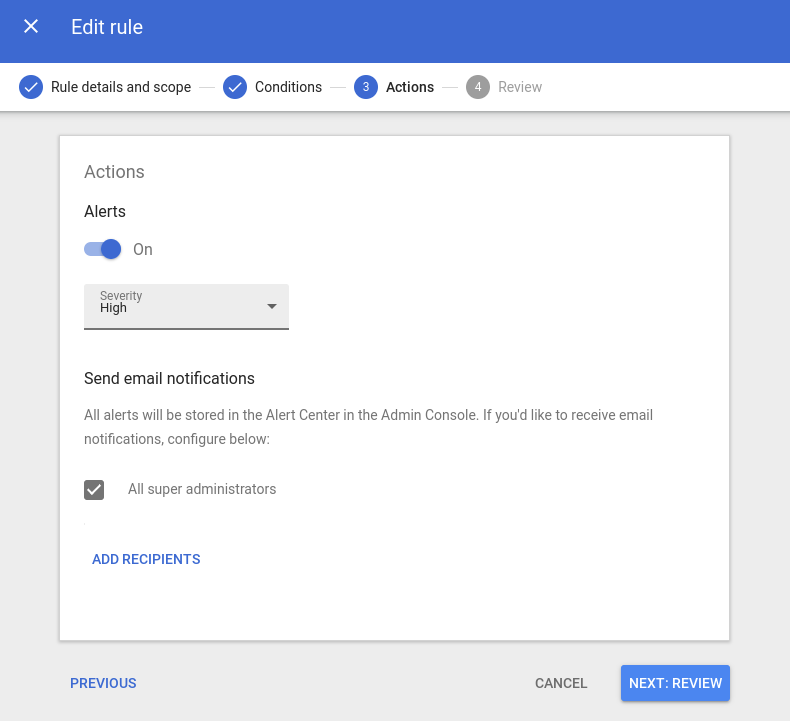 To change or turn off email alerts, they can be adjusted at Admin console > Security > Alert center (gear icon), or directly access the new System defined rules section. Rapid Release domains: These features are already available for all domains. Scheduled Release domains: These features are already available for all domains. Available to all G Suite editions. These features will be ON by default. 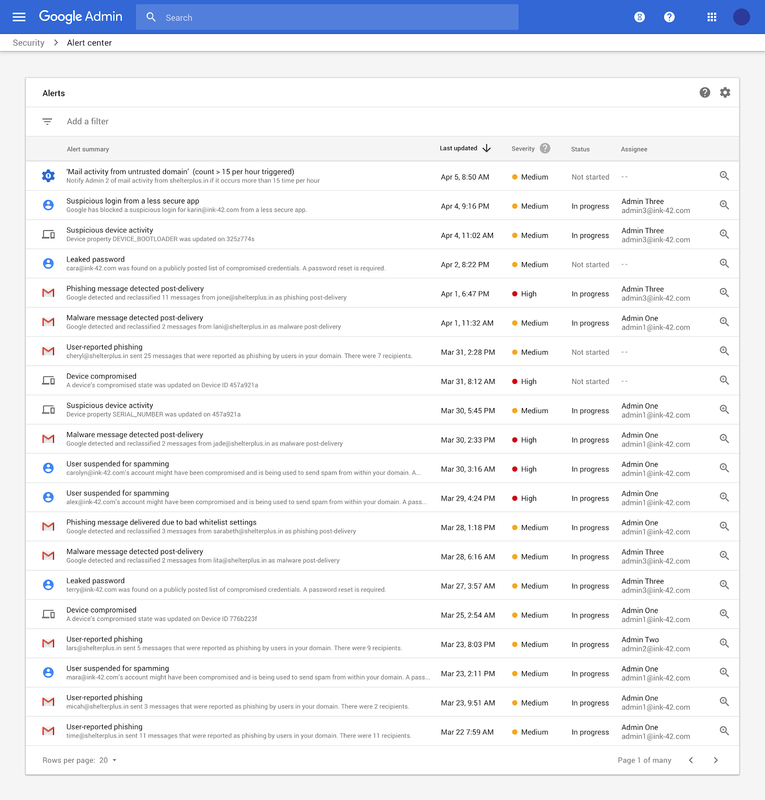 This entry was posted in Apps Feed Blog and tagged Admin Console, apps, Rapid Release, Scheduled Release, Security and Compliance on April 19, 2019 by G Suite Updates. This announcement was made at Google Cloud Next ‘19 in San Francisco. Check out Next OnAir to tune into the livestream or watch session recordings following the event. We’re announcing G Suite Add-ons, a new cross-suite platform that connects G Suite to your favorite workplace apps, in a beta program. Last year we announced a new feature that gives users quick access to Calendar, Hangouts, and Keep from an embedded side panel in G Suite. Today we’re announcing that the side panel is now open for third-party developers. Add-ons help you complete tasks directly from the G Suite app you're using, rather than needing to toggle from one app to another. G Suite Add-ons also surface relevant information and suggest actions based on what you’re working on. For example, a salesperson can find customer info from their CRM tool while drafting a strategy in Docs, an engineer can add tasks to their project management app directly from Gmail, and a recruiter can consult their hiring pipeline while scheduling interviews in Calendar. Once enrolled in the beta, users in the domain will have access to new add-ons from Copper, Box, Workfront, Asana, Evernote, and Cisco, among others. Admins: Express interest in the G Suite Add-ons beta. Once your organization joins the beta program, you can also install chosen G Suite Add-ons for your entire domain via the G Suite Marketplace. End users: Once your organization is in the beta program, you’ll be able to install G Suite Add-ons from the “+” button in the G Suite quick access side panel.The G Suite Add-ons you install will appear in the side panel across G Suite apps and help you complete entire workflows without the need to switch back and forth between multiple apps. All G Suite editions are welcome to apply to this program. 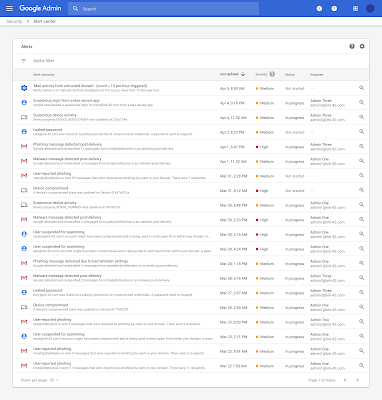 This entry was posted in Apps Feed Blog and tagged Admin Console, apps, G Suite Marketplace, Other on April 10, 2019 by G Suite Updates. We’re making Access Transparency for G Suite generally available. Access Transparency enables you to get more visibility into actions taken by Google staff related to your data. You can view the reason for each access, including references to specific support tickets where relevant, which may help you support your audit requirements. Access Transparency is available to G Suite Enterprise and G Suite Enterprise for Education customers only. At G Suite, we work hard to earn and maintain trust with our customers. Access Transparency supports this commitment to customer trust by giving you fine grained logs of actions taken by Google staff and the reason for each access, including references to specific support tickets where relevant. Verify why Google is accessing your data, such as fixing a fault or attending to your requests. Bring your audit controls closer to what you can expect on premise. Admins: Admins with the Reports privilege can go to Admin Console > Reports > Access Transparency. Use our Help Center to learn more about Access Transparency. View the reason for data access, including references to specific support tickets where relevant. Verify why Google staff is accessing your data, such as fixing a fault or attending to your requests. View and download logs to help you support your regulatory audits or data archival needs, showing extensive information such as accessor location, access justification, and the action taken on a specific resource. Rapid Release domains: Extended rollout (longer than 15 days for feature availability) starting on April 20, 2019. Scheduled Release domains: Extended rollout (longer than 15 days for feature availability) starting on April 20, 2019. Available to G Suite Enterprise and G Suite Enterprise for Education edition only. This entry was posted in Apps Feed Blog and tagged Admin Console, apps, G Suite, Rapid Release, Scheduled Release, Security and Compliance on April 10, 2019 by G Suite Updates. Coverage for Backups: Backup data for covered Apps is now included. Coverage for additional products: Forms’ and new Sites’ covered data is now included. The expanded product and data coverage will not alter any previous settings you may have configured. Your existing settings will be applied to the additional apps and data types covered with this release. As with the prior release, there is no impact to your end users. Data regions has been built keeping in mind the requirements of a geographically dispersed organization. With data regions, you can create as many organizational unit-specific regions as you want with no minimum seat requirements. Your end users don’t have to deal with downtime and continue to enjoy full edit capabilities of all files, even during a data move. Additionally, when file ownership changes happen, or users switch OUs, covered data is moved dynamically according to your settings. Admins: See our Help Center to learn how to choose a geographic location for your data. To ensure visibility into your data move progress, there will be a new ‘Backups’ tab in the data regions dashboard (Admin console > Dashboards). The tab shows a breakdown of the Backup data move progress for each of the covered products. See image below for an example of the new dashboard view. For customers already using data regions, expanded product and data type coverage will automatically be supported according to the pre-established settings. For customers not using data regions, it will be OFF by default and can be enabled on the Company Profile page at individual OU levels. This entry was posted in Apps Feed Blog and tagged Admin Console, apps, Rapid Release, Scheduled Release, Security and Compliance on April 10, 2019 by G Suite Updates. We’re adding an option to use your Android phone’s built-in security key for multi-factor authentication in G Suite. All phones running Android 7.0+ (Nougat) have a built-in key which can be activated. This means your users can use existing phones as a primary 2-Step Verification method to protect against phishing. Using a phone as a security key is currently offered in beta. 2-Step Verification greatly improves the security of your account by adding another layer to your account security and making it more resistant to phishing attacks. By adding the additional option of using your Android phone’s built-in security key, we’re expanding access to phishing-resistant 2-Step Verification method in a convenient form - your phone. This can make it faster for you to implement 2-Step Verification in your organization while keeping user training and overall costs to a minimum. Previously, in order to protect your users against password phishing, the only option was to use a security key fob. With this beta, their mobile phone can be that security key. Admins: See how to enforce the use of security keys in your organization. End users: See how to activate the security key on your phone. Available to G Suite, Cloud Identity, GCP customers, and personal Google Accounts. Available on phones running Android 7.0+ (Nougat) with Google Play Services. Compatible with Bluetooth-enabled Chrome OS, macOS X, or Windows 10 devices with a Chrome browser. Rapid Release domains: Full rollout (1-3 days for feature visibility) starting on April 10, 2019. Scheduled Release domains: Full rollout (1-3 days for feature visibility) starting on April 10, 2019. Available to all G Suite editions in beta. If 2-Step Verification or Security Key Enforcement is turned on for an organization, Android phone will be available as an option for security keys by default. 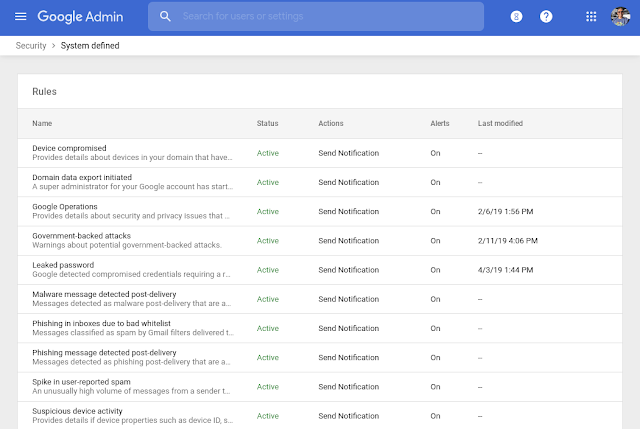 This entry was posted in Apps Feed Blog and tagged Admin Console, apps, identity, Rapid Release, Scheduled Release, Security and Compliance on April 10, 2019 by G Suite Updates. Only users from corporate-owned device and a corporate IP address can access Google Drive. Only a “High Trust” group can access Google Drive when not on a corporate IP address. Only users from an encrypted device with a screen lock enabled can access Gmail. Device policies as reported through the Endpoint Verification extension, including whether a device password is active, device encryption status, minimum OS versions, and company-owned devices. You can apply policies by OU or to the whole domain, and all admin activity is logged in audit logs in the Admin console > Reports > Admin view. Not available to G Suite Basic, G Suite Business, G Suite for Education, G Suite for Nonprofits, and Cloud Identity Free. Find out more and sign up for the new security center beta here. This beta will also allow you to send notifications to the alert center, where teams of admins and analysts can work together to take ownership of alerts and update status as they work through security investigations. For more information on the latest updates to the alert center, see this announcement. 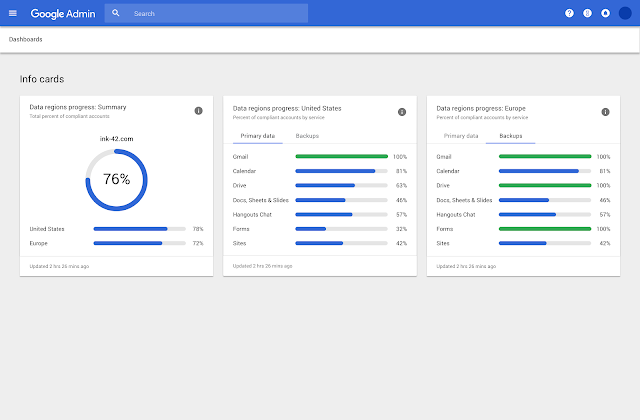 The G Suite security center already helps you protect your organization with security analytics and best practice recommendations from Google. It provides a unified security dashboard, a tool to investigate and remediate threats, and more. These features in the beta will make it easier to assess and manage threats by adding automated actions, improved tracking, and more to help your whole team understand and improve your security posture. Admins: Find out more and sign up for the new security center beta. We want to make sure admins are able to work together and collaborate to assess their organization’s exposure to security issues. With this beta launch, admins can now save their investigations in the security investigation tool and share them with other admins to improve collaboration. Admins can also create automated rules to perform remediative actions or send notifications to the alert center, where teams of admins and analysts can work together to take ownership of alerts and update status as they work through security investigations. Available to G Suite Enterprise, G Suite Enterprise for Education, and Cloud Identity Premium. Not available to G Suite Basic, G Suite Business, G Suite for Education, and G Suite for Nonprofits. This will be OFF by default and only available to domains that sign up for the beta. 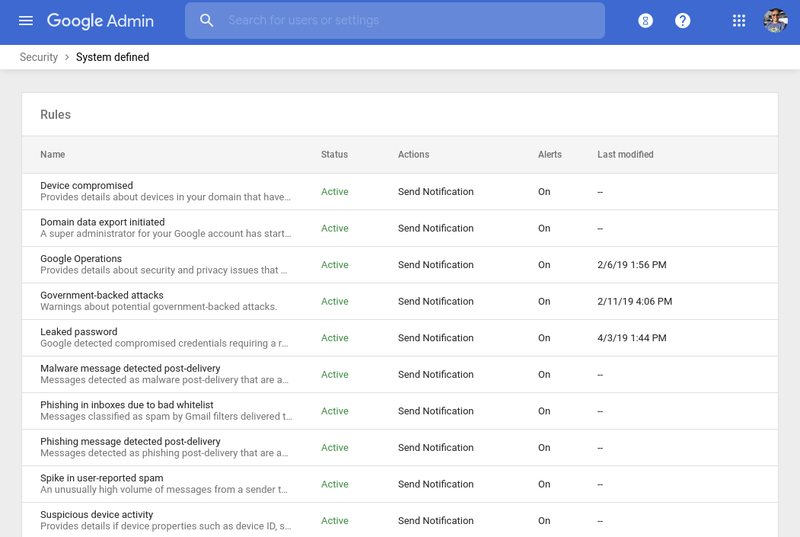 This entry was posted in Apps Feed Blog and tagged Admin Console, apps, Other, Security and Compliance on April 10, 2019 by G Suite Updates. Set status, assignee, and severity of alerts: Add key information to help your team take ownership of, assess, and collaborate as you work through security investigations. Use a more powerful search: Find alerts more easily by searching for alerts that contain a specific email address. See alert change history: See the history of metadata or content updates to that alert. This includes when status, assignee, or severities have changed. Find out more and sign up for the alert center beta here. The alert center already provides a single place to see notifications about potential issues within your domain, and take action to resolve the issues. We hope the enhancements in this beta will improve collaboration between admins and related teams with status, severity, and assignee information now available. We also hope it will make it easier to find patterns within alerts by adding more specific search capabilities and surfacing related alerts proactively. Admins: Find out more and sign up for the alert center beta here. Admins will be able to see the operating system (OS) version for devices with basic mobile management. Previously, this information was only available for devices with advanced mobile management. OS version is an important piece of information for assessing device security. This is because devices with older OS versions may not receive all security patches and can be more prone to threats. With visibility into the OS versions used by more devices in your organization, you can better understand potential security vulnerabilities and take actions to make sure devices with access to corporate data are using OS versions you see as appropriate. Admins: To see OS version for basic devices, go to Admin console > Device Management > Devices. On the devices list page (Admin console > Device Management > Devices) in the OS column. Previously this would have been blank for basic devices. On this page, admins will be able to filter devices with a specific OS to find devices with specific vulnerabilities or see what impact an OS update policy may have. In the device detail page for each device. In the audit logs at Admin console > Reports > Devices. Note that this is only available to G Suite Business, G Suite Enterprise, and G Suite Enterprise for Education domains. Rapid Release domains: Extended rollout (potentially longer than 15 days for feature visibility) starting on April 4, 2019. Scheduled Release domains: Extended rollout (potentially longer than 15 days for feature visibility) starting on April 4, 2019. 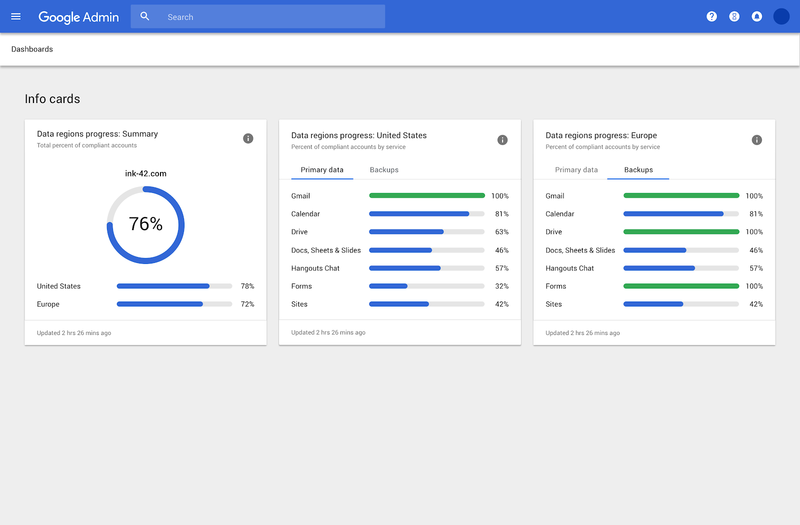 This entry was posted in Apps Feed Blog and tagged Admin Console, apps, MDM, Rapid Release, Scheduled Release on April 4, 2019 by G Suite Updates. As part of the migration from classic Hangouts to Hangouts Meet that we announced last year, G Suite admins can now turn off classic Hangouts video calling for your organization. This means that all video calls in your organization will use Meet and any classic Hangouts video calls saved in Google Calendar will be removed. Enabling this setting expedites the transition of your organization to Hangouts Meet. If you take no action, Calendar migration can continue to run and we'll automatically transition your organization to be Meet-only on our recommended schedule. End users: No action required. If your admin decides to enable this setting, classic Hangout video calls will no longer be joinable. Please note, if you’d like to add Hangouts Meet video calls to replace removed classic Hangouts video calls, you must manually add one back into the Calendar event. All video calls scheduled in Calendar will use Meet. This does not impact events scheduled by someone outside of your organization. Any classic Hangouts video call URLs scheduled in Calendar will be hidden. Classic Hangouts video calls scheduled within your organization will no longer be joinable and users will see an error message. Classic Hangouts video calls scheduled by someone outside of your organization will still be joinable. You can use a custom meeting name to start an ad-hoc Meet call. Simply agree on a meeting name with all of the meeting participants and type it into the “Enter meeting code” field in Meet. Note that all participants must be in the same domain to use the name. Please note, this change does not impact video calling from Hangouts Chat or classic Hangouts chat. This will continue to behave the same. Additionally, this change will not impact domains who do not have Meet turned on. Admins should only enable this option if your organization is primarily on Meet with limited to no classic Hangout video calls scheduled in Calendar. You can check the usage stats for scheduled Calendar events using classic Hangouts video calling by using the Hangouts Meet audit log. To do so, query the number of calls containing a “Calendar Event Id” with “Product type” equal to classic Hangouts. Finally, this setting is reversible. Unselecting this in the Admin console means that classic Hangouts video calls will again be shown in Calendar. Rapid Release domains and Scheduled Release domains: Admin console setting is currently available. This entry was posted in Apps Feed Blog and tagged Admin Console, apps, Hangouts Meet, Rapid Release, Scheduled Release on April 2, 2019 by G Suite Updates.